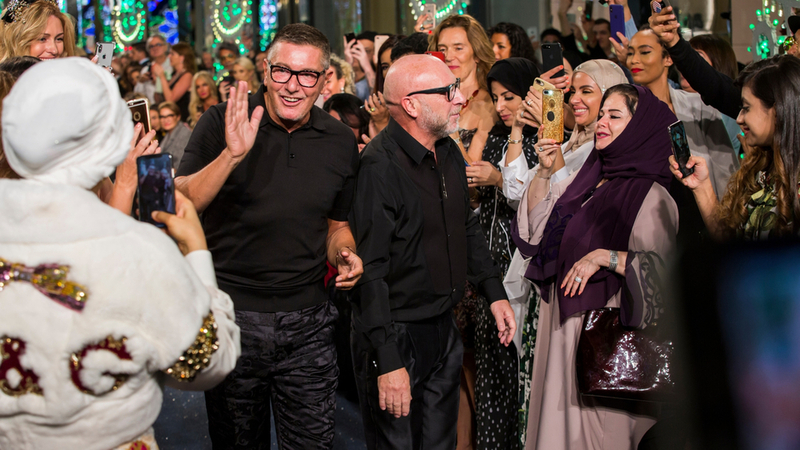 What was supposed to be the biggest fashion show (500 looks) in Dolce & Gabbana’s 33-year history has been cancelled due to a new scandal. The brand has also been pulled from the YNAP Group, and a host of other retailers. A recap, if you’ve been hiding: the designer duo caused outrage when they shared a video created to promote an upcoming show in Shanghai, which depicted an Asian woman eating a bowl of pasta and pizza with chopsticks. The whole thing was not cute. Out of touch, it very much appeared to be mocking the Chinese, hence followers and social media onlookers being quick to label the video as racist. Then it got worse. On Instagram, a debate started between Stefano Gabbana’s verified Instagram account, @stefanogabbana, and the user @michaelatranova about whether the ads were racist. Sadly, @stefanogabbana begins saying that Chinese people eat dogs, and uses the smiling poop emoji to describe how he’ll refer to China in future interview. “China Ignorant Dirty Smelling Mafia,” one @stefanogabbana post says. So at first I thought Why cover this on TPOF? Stefano Gabbana is racist, social media made this fact known, and now the brand will face financial repercussions. A fair and natural conclusion. It’s not psychology. But isn’t everything psychology? In the study of how the mind works and how it influences a person’s behavior, racism is confusing at a real ‘why tho’ kind of level. Let’s read that again with a fashion eye. Research has shown that when people are given reminders of their own mortality (POTENTIAL IRRELEVANCE), they feel a sense of anxiety and insecurity, which they respond to by becoming more prone to status-seeking (LOGOS LOGOS LOGOS), materialism (INCREASINGLY GAUDY DESIGNS), greed (EXPANSION), prejudice (ITALY IS THE BEST), and aggression (RAGING ON INSTAGRAM). It pains me to write this because I love classic Dolce & Gabbana. It’s the stuff of fairytales. Like the Alta Moda 2014 in Capri? C’mon. Italy is incredible and singular is so many ways, and it’s no surprise they’re proud of it. But it’s no longer the Nineties, when marketing was more straightforward and everyone elsewhere would fawn mindlessly over anything European. So perhaps the duo’s struggle to evolutionize their Italian heritage-brand DNA for the current fickle market has caused some insecurity, and this corresponding aggression and racism. What do these confusing, globetrotting, often third-culture kids want these days? Domenico and Stefano might wonder as they stare out over the Bay of Paraggi. We let them walk on the runway, isn’t that enough? Well, no. And this fiasco sure didn’t help. Let’s hope Mr Dolce and Mr Gabbana do some soul searching.